We are inviting real submissions that describe fictional papers and workshops. Practically speaking, we would like you to submit a title of a fictional paper or workshop, along with a list of authors (authors may be real or fictional), and a set of up to 4 keywords. The papers and research should be fictional, however we may contact successful authors for additional commentary after the notification period. All submissions will go through a rigorous fictional review process. As the proceedings are fictional they will not be archived, however we intend to publish the conference programme as part of the “Future Scenarios” track at NordiCHI 2016. We seek submissions that imagine possible futures for research on the relationships between computers and people. Submissions will include two portions: a fictional document related to the conduct of research and an author statement about the document. The fictional document could be an extended abstract, a call for papers, an excerpt from API documentation, a book review, a study protocol for IRB review, or any other relevant type. The author statement should connect that document to current events, cite on-going research in the field, or otherwise extrapolate how the envisioned future might arise from our given present. This statement will be especially important for abstracts (which are too short to explain their rationale), API documentations (which typically do not provide a historical rationale), and other documents that on their own may be exceptionally short and/or vague. Because Design Fictions are archival contributions, we recommend a minimum length of 3 pages (notes), and as many as 10 pages (papers), following the ACM Standard Format. The reviewing process will be the same as the general track, and Design Fiction papers or notes will be included in the proceedings. 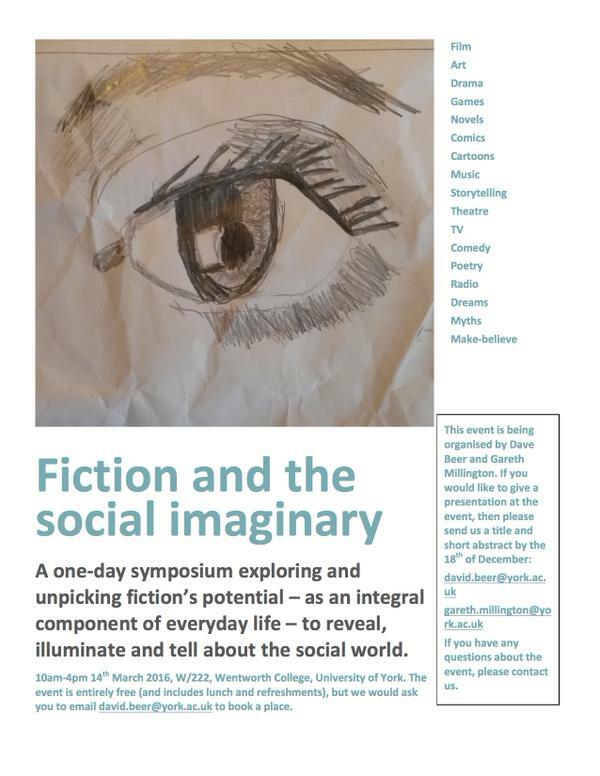 This event by David Beer at York looks fantastic. I’ve just submitted an abstract to talk about how representations of techno-fascism, post-capitalism and collapse can be used as a resource for social theorising. I find this idea really exciting and I invited Tim to give a talk when he visits London. If you’d like to come then you can register here. It’s a free event that will take place at Goldsmiths on the afternoon of May 13th. I’ll be talking, as will Les Back, Keith Kahn-Harris and Sarah Burton. For a workshop on future London, five individuals — Arup, Social Life, Re.Work, Commonplace, Tim Maughan and Nesta—created 10 Future Londoners for the year 2023. This is a short fictional piece describing the working day of 19 year old Nicki, a zero hours retail contractor. People talk about the future of technology in education as though it’s right around the corner, but most of us get to that corner and see it disappearing around the next. This innovation-obsessed cycle continues as we are endlessly dissatisfied with how little difference these promises make to the people implicated in these futures. These products and practices, cloaked in the latest buzzwords and jargon, often trickle down to non-western geographic regions after they’ve been tried and rejected, yet still adopted as the new and advanced “western” methodology that will solve the “problem” of education. In an attempt to cut through the relentless TED Talk-like optimism of ed tech marketing, this year at the HASTAC conference in Peru we presented a series of fictional case studies. These four design fiction based personas aimed to illustrate the possible impact on society and education, in both positive and negative ways, of not just emerging technologies but also global social and economic trends. They give brief snapshots of the lives of individuals in imagined futures from different geographic, ethnic, economic, and cultural backgrounds, illustrating how each of them might interface and interact with the different technologies.